New geometrical design sees the head stretched and flattened to touch the dimensional limits. Deeper CG location for longer and straighter off-centre shots, as well as optimum ball flight and maximum forgiveness. 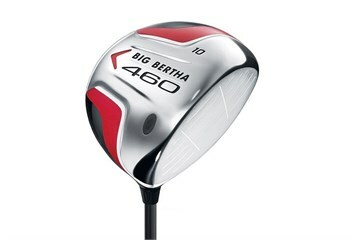 The shallower face of the Callaway Big Bertha 460 inspires confidence at address. New Correct Alignment Stripe allows golfers to consistently square the club face at address to ensure correct alignment. Have come back to playing (socially) after about 10 years and need to upgrade my old clubs. Driver was a weak point in my game and I had no confidence with it. Someone recommended I give the BB 460 (with the alignment sole) a shot and glad I did. Driving has very quickly become an effortless affair. Club is excellant, getting extra distance and more drives on fairway. A drive in the park! Excellent driver, well balanced and easy to hit. But I already knew that as I have one with my set of clubs in the Middle East. A very good buy.